a small loss: Go Greens! Last week, I attended a dinner and a Challenge class at Whole Foods. 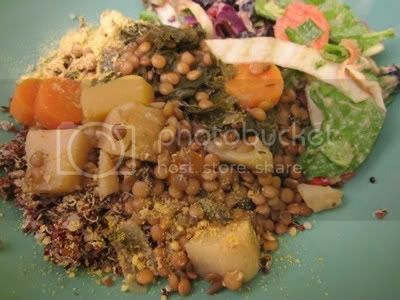 The dinner was quite good - a kale lentil stew with quinoa and a coleslaw made with avocado dressing and blueberries. 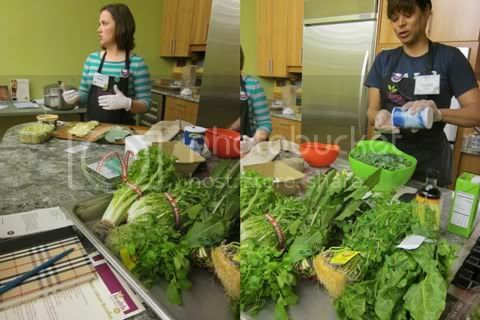 Then Becky and Bonita, two of Whole Foods' Healthy Eating Specialists, lead a class for me and some of the other Challenge bloggers about cooking with greens. It's easy to fall into the routine of just steaming them - or cooking them up with oil, which seems pretty contradictory to choosing to eat greens in the first place. They showed us a few different kinds of greens, then made a few different recipes to highlight their versatility. Becky made pinwheel sandwiches using collard greens, hummus, and broccoli slaw; Bonita made the massaged kale salad I recreated for lunch a couple of days ago. They also cooked up bok choy with liquid aminos and made a spinach and frozen fruit smoothie - all delicious, and outside of the plain-iceberg-lettuce-salad box. We all received a bunch of collards and were told our homework was to cook them up in a new way and report back at tonight's class. I made them last week with tomatoes and spices alongside a seitan and potato hash. 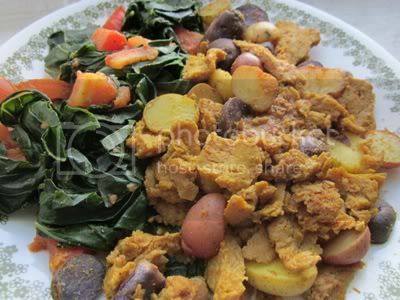 I found the recipe on this blog but modified it to eliminate the oil. Tomorrow starts week 3 of the challenge and I'll be using only naturally occurring oils, no added ones (though, to be honest, I've already pretty much been doing this). No matter what eating plan you follow, you need to have some fats; the goal of this elimination is not to get rid of fats but to make them more plant-based. So, instead of using olive oil, I eat olives; instead of sunflower oil, I toss some sunflower seeds on my salad. Even though olive oil is a better choice than, say, bacon grease, it's still added fat and calories that aren't necessary for many cooking processes. You can easily replace it with something like wine, orange juice, or even just water. We'll be talking more about cooking without oil at tonight's class - I can't wait to report back with what I find out! What about you? What's your go-to healthy swap/substitution in recipes? What are your favorite leafy greens? How do you like to prepare them? I would have NEVER put those ingredients with Quinoa - interesting but sounds delicious!!! I love spinach. I love it as a base for a salad, I love it wilted, and if I ever get a new blender, I want to try it in a smoothie. I had no idea you could use orange juice and water as a substitute for oil! I can't wait to hear more about that! I learn so much from your blog. Thanks, Mary! So fun to meet you tonight! I am so impressed by your weight loss, you go!